New A-head sections on “Changes over Time: Entry Choices and Industry Dynamics” (Ch. 3), “The Value Chain and Strategic Activity Systems” (Ch. 4), “Platform Strategy” (Ch. 7), and “Organizing for Innovation” (Ch. 11). All new or updated and revised Chapter Cases, including: Sheryl Sandberg at Facebook and Uber vs. Lyft. New full-length cases and detailed teaching notes including Netflix, Starbucks, Disney, and Walmart. Click here to see a detailed list of things that are new to the 4e. ExpressBooks provide ready-to-go course content for any type of class! Select or modify any of these ExpressBooks that pair chapters and cases for courses of various lengths and levels. Add Cases and/or Capstone® Simulation to complete your course materials! Author-designed “Teaching Notes” will be added to your complimentary copy as you build your perfect casebook. A discounted ebook of all chapters and MiniCases is available here for $99.00! New: 4e Strategic Management is now available as a discounted bundle with Capsim’s Capstone® strategy simulation. Find out more! Or Request a demo! FRANK T. ROTHAERMEL (PHD) is a professor of strategic management and holds the Russell and Nancy McDonough Chair in the Scheller College of Business at the Georgia Institute of Technology. Frank is also an Alfred P. Sloan Industry Studies Fellow. He received a National Science Foundation (NSF) CAREER award, which “is a Foundation-wide activity that offers the National Science Foundation’s most prestigious awards in support of . . . those teacher-scholars who most effectively integrate research and education” (NSF CAREER Award description). Frank is also the area coordinator for Strategic Management. 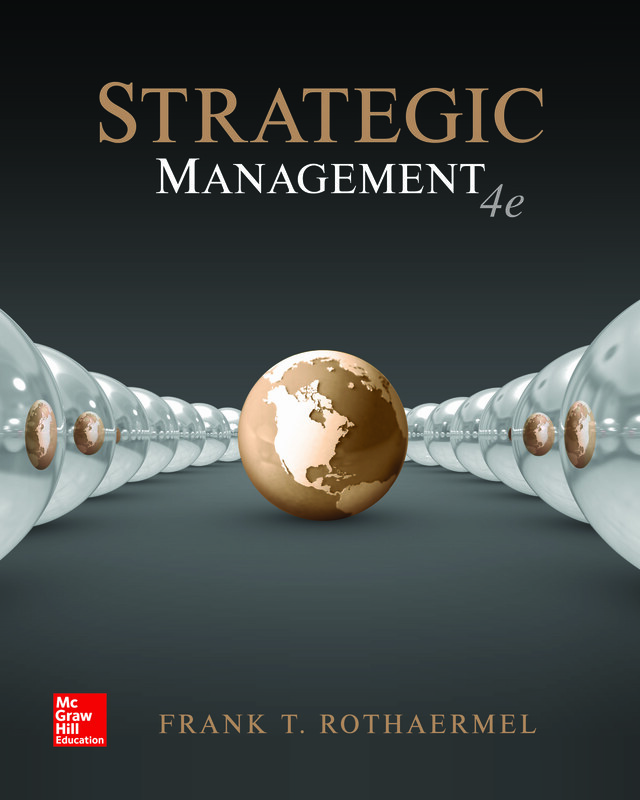 The “Essentials of Strategic Management” selection contains the 5 most fundamental textbook chapters from 4e plus the 5 most popular MiniCases. These were selected for a first introduction to Strategic Management, targeted at both traditional and non-traditional student audiences. Contains the 8 core textbook chapters from 4e matched with the most popular 8 MiniCases for undergraduate audiences. Also includes the popular module “How To Conduct A Case Analysis” plus the most popular 7 full-length cases, especially selected for use in undergraduate programs. Detailed and well-structured teaching notes are available for all cases. Contains all 12 textbook chapters from 4e matched with the most popular 12 MiniCases for undergraduate audiences. Also include the popular module “How To Conduct A Case Analysis” plus the most 11 full-length cases, especially selected for use in undergraduate programs. Detailed and well-structured teaching notes are available for all cases. Contains the 8 core textbook chapters from 4e matched with the most popular 8 MiniCases and most popular 8 full-length cases, especially selected for use in day, evening, weekend MBA programs. Detailed and well-structured teaching notes are available for all cases. Contains all 12 textbook chapters from 4e matched with the most popular 12 MiniCases and most popular 12 full-length cases, especially selected for use in day, evening, weekend MBA programs. Detailed and well-structured teaching notes are available for all cases. Contains the 5 key textbook chapters from 4e selected for an Executive (MBA) audience, matched with the most popular 5 MiniCases for executive audiences. Also, includes the most popular 5 full-length cases, especially selected for use with executive audiences. Detailed and well-structured teaching notes are available for all cases. Contains the 10 key textbook chapters from 4e selected for an Executive (MBA) audiences, matched with the most popular 10 MiniCases for executive audiences. Also, includes the most popular 10 full-length cases, especially selected for use with executive audiences. Detailed and well-structured teaching notes are available for all cases. Contains all 22 MiniCases from 4e, including 15 brand-new MiniCases, several of which focus on companies from emerging economies such as China and India, as well as other international firms from Denmark (LEGO), Germany (Volkswagen, Porsche), South Korea (Samsung), Japan (Sony, Nissan), etc. Also includes the most popular MiniCases from the third edition, all of which were updated. Teaching notes are available for all MiniCases. Contains the 6 most popular full-length cases from 4e plus the popular module “How To Conduct A Case Analysis.” Detailed and well-structured teaching notes are available for all cases. Contains the 8 most popular full-length cases from 4e plus the popular module “How To Conduct A Case Analysis.” Detailed and well-structured teaching notes are available for all cases. Contains the 10 most popular full-length cases from 4e plus the popular module “How To Conduct A Case Analysis.” Detailed and well-structured teaching notes are available for all cases. Contains all 23 full-length cases from 4e plus the popular module “How To Conduct A Case Analysis.” Detailed and well-structured teaching notes are available for all cases. Contains all MiniCases and all 23 full-length cases from 4th edition, as well as, the popular module “How To Conduct A Case Analysis.” There are detailed and well-structured teaching notes available for all cases. Contains all MiniCases and all 23 full-length cases from 4th edition, as well as, the popular module “How To Conduct A Case Analysis.” There are detailed and well-structured teaching notes available for all cases. Contains all 23 full-length cases from 4e plus the popular module “How To Conduct A Case Analysis.” Detailed and well-structured teaching notes are available for all cases. Contains the 8 core textbook chapters from 4e matched with the most popular 8 MiniCases for undergraduate audiences. Also includes the popular module “How To Conduct A Case Analysis” plus the most popular 7 full-length cases, especially selected for use in undergraduate programs. Detailed and well-structured teaching notes are available for all cases.Contains the 10 most popular full-length cases from 4e plus the popular module “How To Conduct A Case Analysis.” Detailed and well-structured teaching notes are available for all cases. Contains all MiniCases and all 23 full-length cases from 4th edition, as well as, the popular module “How To Conduct A Case Analysis.” There are detailed and well-structured teaching notes available for all cases. Contains all 23 full-length cases from 4e plus the popular module “How To Conduct A Case Analysis.” Detailed and well-structured teaching notes are available for all cases. Contains the 8 core textbook chapters from 4e matched with the most popular 8 MiniCases for undergraduate audiences. Also includes the popular module “How To Conduct A Case Analysis” plus the most popular 7 full-length cases, especially selected for use in undergraduate programs. Detailed and well-structured teaching notes are available for all cases.Contains the 10 most popular full-length cases from 4e plus the popular module “How To Conduct A Case Analysis.” Detailed and well-structured teaching notes are available for all cases.